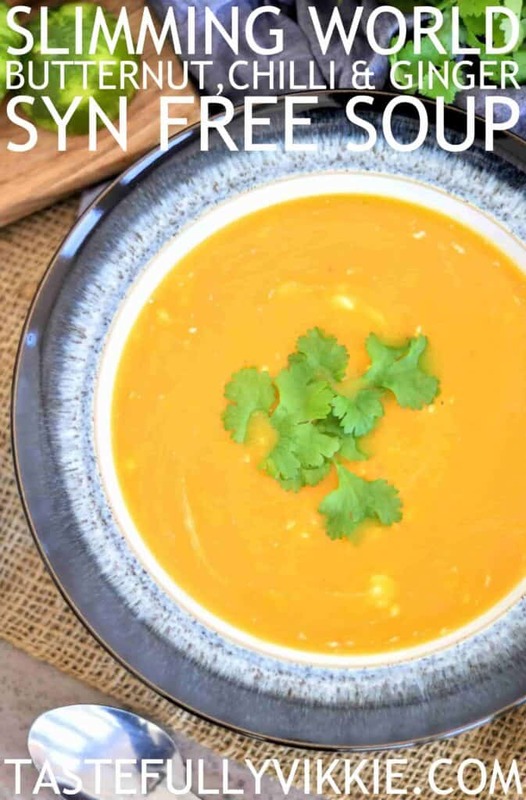 This delicious Slimming World Syn Free butternut squash soup can be made in the soup maker, pan, multicooker or slow cooker. You will find the recipe at the bottom of this page, but please ensure you read all cooking tips and suggestions. Whenever I now eat anyone else’s butternut squash soup, I am always disappointed. A few years ago, I discovered Lorraine Pascale’s 2nd cooking programme and loved how her enthusiasm which quickly brushed on to me. So when her cookbook, Home Cooking Made Easy came out, I kept nipping over to Waterstones after work and would take a glance at her book and finally committed to buying it. 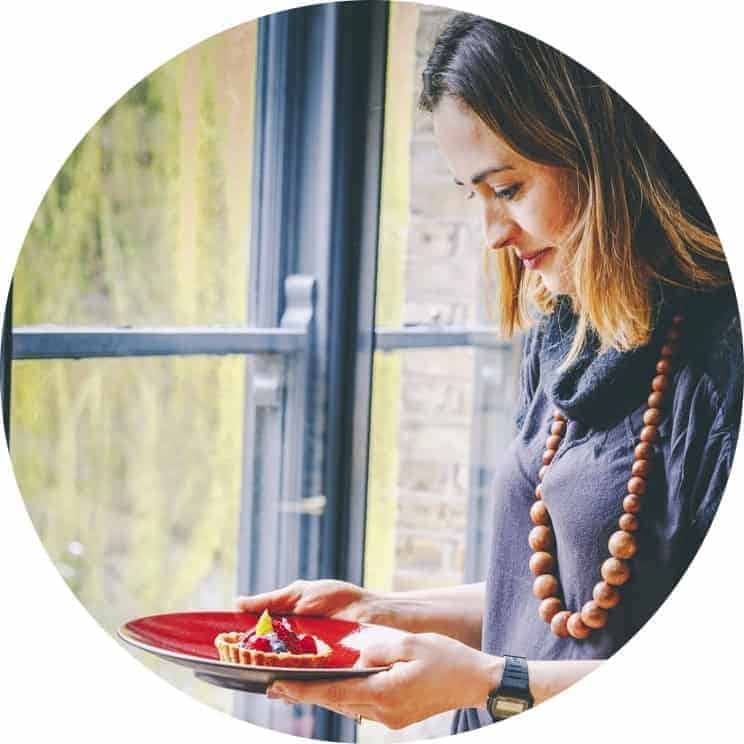 I ransacked my kitchen (and her book) and tried loads of recipes. Chocolate fudge, cheesecake, flavoured butters, peanut brittle; even her steamed Mars Bar sauce pudding and along with so many others. In fact, here’s my very dog eared copy where I’ve spilt many sauces and water on it that quite a few pages are now stuck together. But surely this is a good sign? 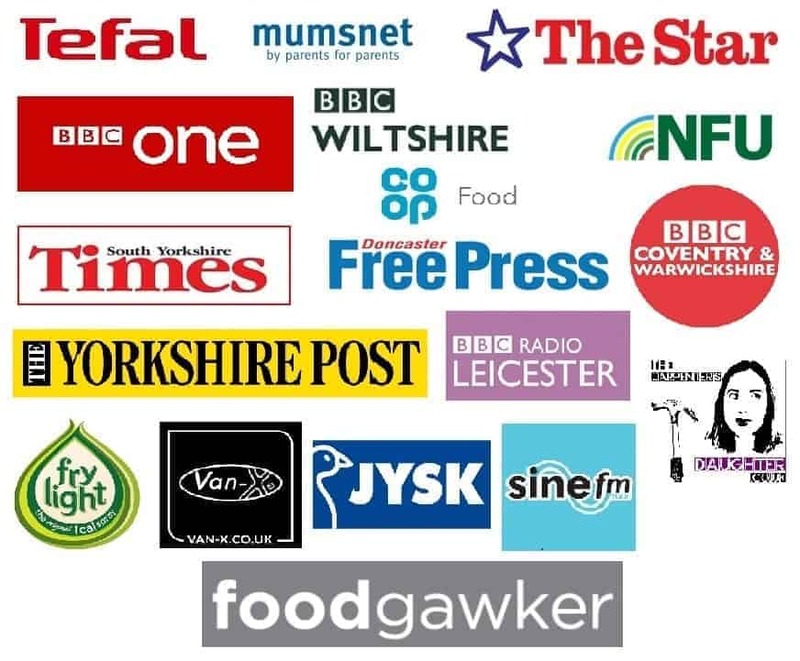 I’m certainly proud as each recipe tells many a tale and so much so that when I attended the BBC Good Food Show at the Birmingham NEC for it to be signed. I remember Lorraine saying with a big smile on her face, “Oh, you’ve USED it!” I did indeed. You can just about see the warped corners on the bottom right of the book. HOW MUCH CHILLI SHOULD I USE? My fiance were in our very early stages of living together when I made this recipe. Originally I wasn’t following a Slimming World plan, so followed it to the letter. But when it came to chillis, I had little to know knowledge of how hot they would be. The recipe suggested a pinch of flakes (fair enough), or 1 to 2 fresh chillies, deseeded and finely diced. Well, I think I added one medium sized red chilli and when my fiance got home, he simply couldn’t eat it. The trouble was, as I’d taste it while cooking along, it was very difficult to taste the heat once I’d had some. It’s can be a very tricky judgement call. So, if you, or your family don’t like things too hot, then try just a pinch of dried chilli. But bear in mind, once you add too much, it’s hard to reverse it. And sometimes adding too much yogurt to counteract it can then totally change the rest of the dish, making it sour. Halve, deseed and score before roasting in the oven for 30 minutes (or until the flesh can be easily pricked with a fork). Place in the slow cook, left whole for 3-4 hours on high or 6-7 hours on low. 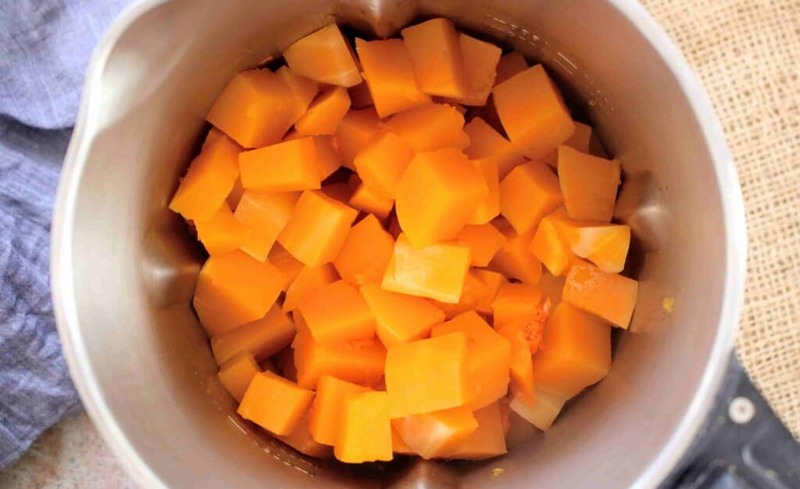 Chop in to chunks, place in a microwaveable bowl and cover with clingfilm before heating for 10 minutes. (See images below). Although, on this occasion, I microwaved, deep down my favourite cooking method is to place it in the slow cooker, whole. However, it’s definitely not the quickest method is you need dinner on the table within the hour. 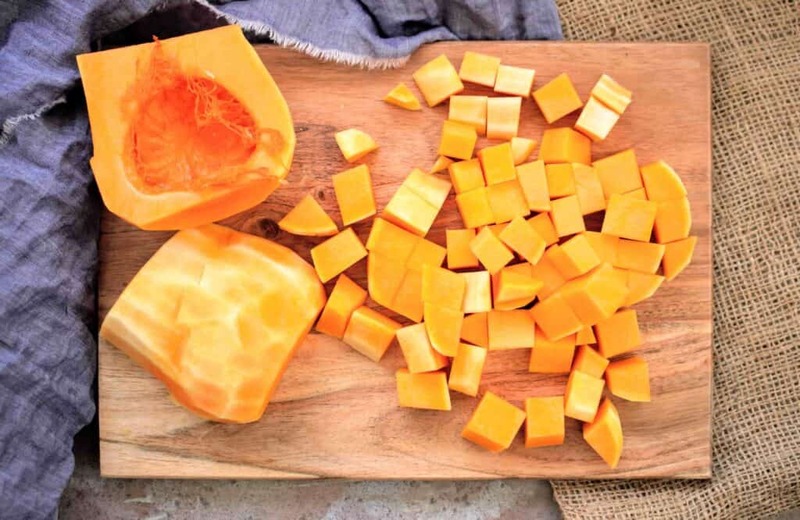 One of the main reasons I have a love hate relationship with the butternut is because its very tough skin. It can be is a pain in the bum, but microwaving is certainly quicker. However, if you plan this recipe ahead and leave your slow cooker to do all the work, all you need to do is slice in half, remove the seeds and place the whole thing in a deep based pan or soup maker. No, this is not a typo; you don’t even need to peel it as it’s blends a charm and you won’t even notice in the end result. SOUP MAKER, PAN, MULTICOOKER OR SLOW COOKER? The beauty about most of my soups is that they fit in my Morphy Richards Soup Maker as well as being able to cook it in a deep based pan, multicooker or slow cooker. No, soup makers definitely aren’t essential because soup was invented well before this machine. However, I simply love mine as it takes the babysitting out of cooking and blends for me, without having to use and clean a separate gadget. When I first got my soup maker though, I tried a few recipes dedicated for my machine and they tasted nothing as good as I was used to. 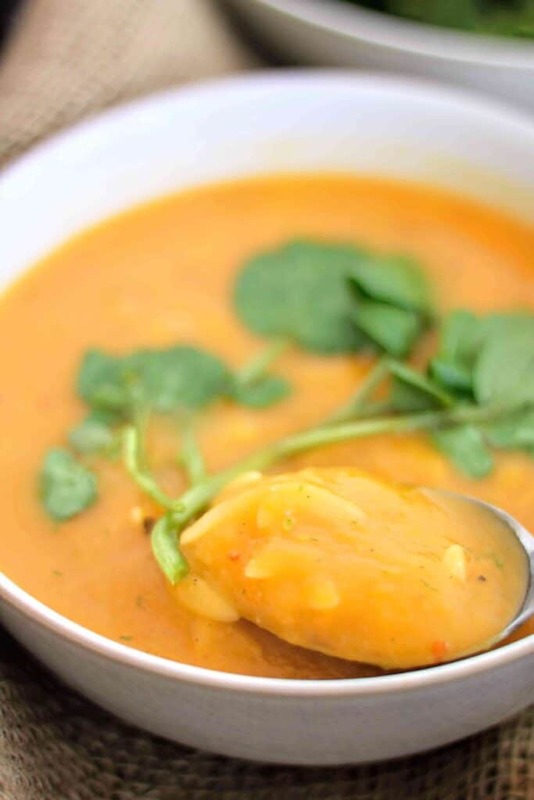 Without pasta, this syn free soup is lighter, but still delicious. However, if you’re looking for a thicker soup, then why not try adding 60g of dried orzo? Not only does it add extra bulk to the soup, but it changes the viscosity as you can see on my spoon below. For my soup maker, I cook my soup on the ‘smooth‘ setting. Then once it has finished, I add 60g of dried orzo, then set my machine to cook on ‘chunky‘. If you are cooking with in any other method, just add the orzo once your soup has cooked, and simmer while stiring until it is tender. This usually takes abut 10 minutes; roughly the same length as regular pasta. Orzo is a syn free dried pasta that comes in a similar shape and size to grains of rice. It’s also great for a cheat’s risotto too. 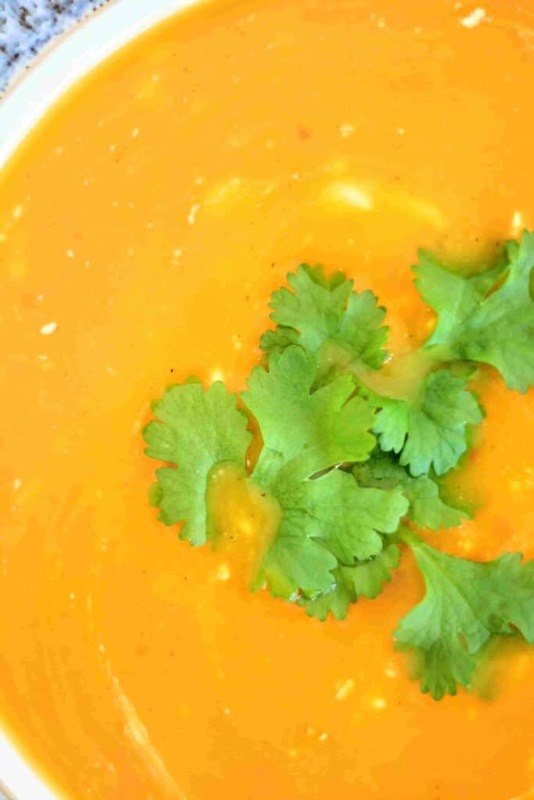 Yes, I’ve frozen many of my soups, including this one. I store mine in individual Sistema soup mugs, so I can easily divide my portions and pop them straight in to microwave like a ready meal. It’s a good idea to label your soups as I’ve often forgot what I’ve frozen and keep it for up to 1 month. As for the fridge, I store mine for around 5 days at the most, then heat it through before serving. TELL US YOU MADE THEM! We love to see your foodie pics of our recipes! If you enjoyed them, why not tag #TastefullyVikkie so we know you made them! You can also find us on Facebook, Twitter, Instagram and Pinterest. 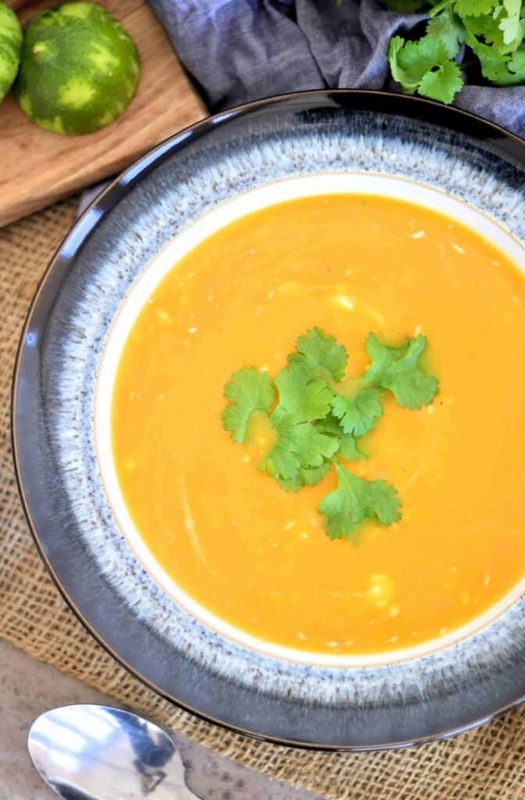 This delicious Slimming World Syn Free butternut squash soup can be made in the soup maker, pan, multicooker or slow cooker. 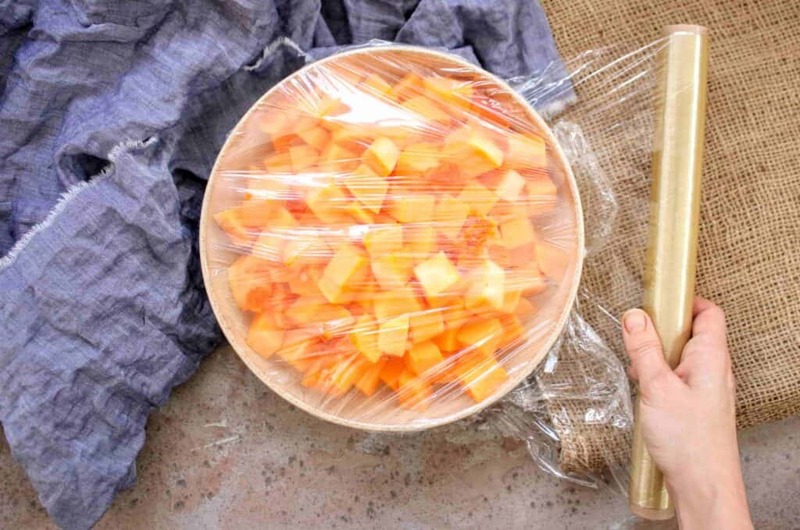 Cover the diced butternut squash with clingfilm, then microwave for 10 minutes to speed up the cooking time. Meanwhile, spray your deep base pan (or frying pan if using a soup maker) with Frylight and saute the onions, ginger and garlic until softened. Now add the remaining herbs and spices (except fresh coriander, lime and orzo if using) to the pan and continue frying for 5 minutes. 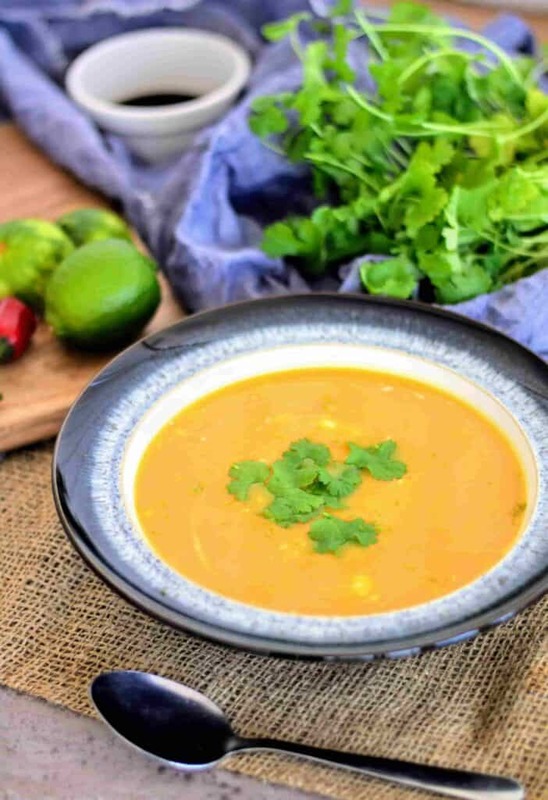 Once the butternut squash is cooked, transfer to the soup maker or deep base pan along with everything else (again, except the fresh coriander, lime and orzo if using). 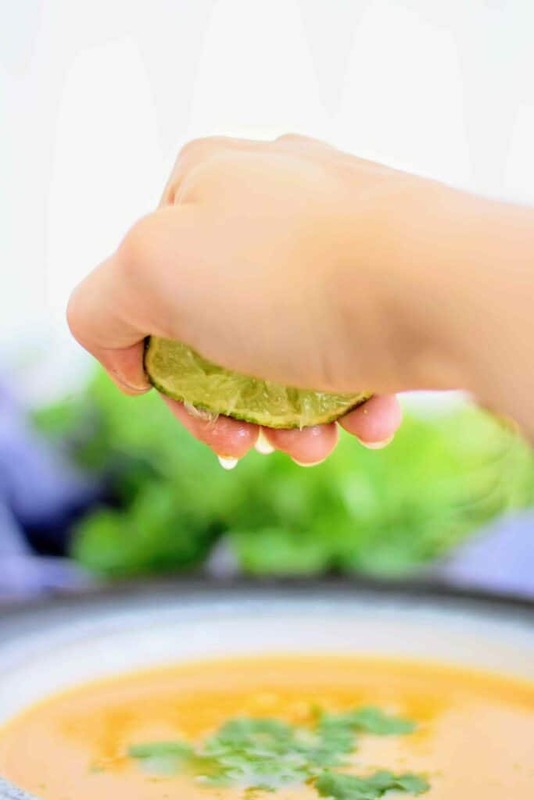 Set your soup maker to smooth, or is using a pan, just bring to the boil and blend. Now everything is tender, you can add the orzo and cook the soup maker to chunky, or leave to simmer in the pan for about 10 minutes (or as per instructed on the back of the packet). 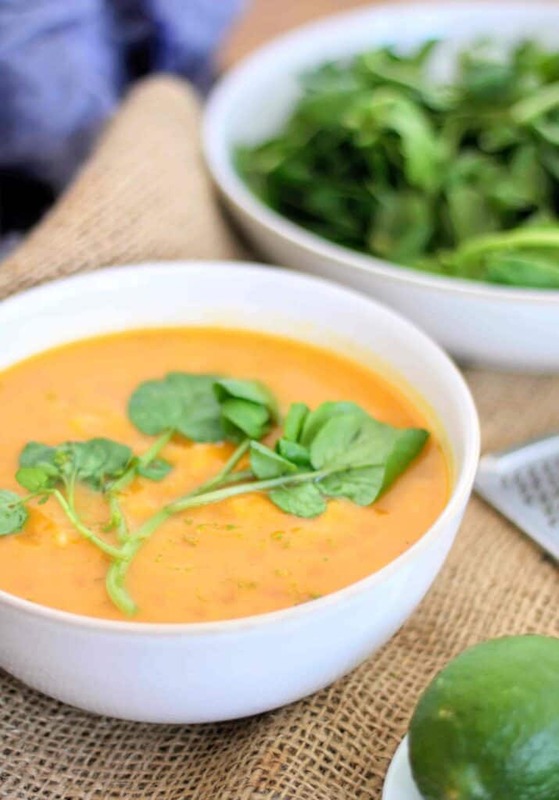 Stir in the zest, juice and garnish with fat free natural yogurt, fresh coriander or even watercress and enjoy. 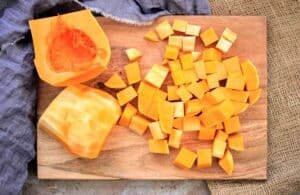 Am going to try this butternut squash soup recipe – at which point do you remove the skin from the squash? Hi Vikki, I have just bought a soup maker and am already on Slimming World food optimising. I also bought your e book for recipes using the soup maker. 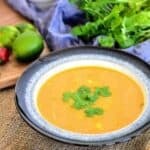 My question is this: how do these soup recipes fit with food optimising as they can’t be syn free I wouldn’t have thought. How can I fit these into my eating regime and keep within my sun quota?